IKEA cabinets – people love them or hate them. Sarah Richardson uses them in many of her homes, including her million dollar plus rehabs featured on Sarah’s House. Personally, I love them and have installed them in every house I’ve owned – that’s two full kitchens and an island in 10 years. Today, IKEA launched the US version of its brand new cabinetry system SEKTION, which replaces the AKURUM system and brand name. I’ve been eagerly awaiting SEKTION’s debut since late summer, when I first hear the rumors that AKURUM was being phased out. At the time, I was busy planning a client’s IKEA kitchen. We made the conscious decision to delay the remodel until the new line arrived because it promised so many new features that are perfect for creating a more custom look and maximizing a small space, which happened to be two of our top priorities. The line was available in the UK mid 2014. There are some new door styles, but most of the doors look pretty similar to the tried and true AKURUM favorites just updated with brand new names. The excitement lies primarily in the new cabinet configurations. Higher end cabinet lines, particularly the European brands, have offered these cabinets for years. But, if you could only afford stock cabinets, you were stuck with less options that were less efficient. The new system is all about drawers…all kinds of drawers including drawers inside of drawers. Some of my favorite additions include: sink cabinets with drawers for trash and recycling; cooktop cabinets with drawers for pots and pans; wall cabinets with drawers that sit on the countertop; base cabinets with glass fronts; half-height drawers for silverware and other utensils; tall cabinets with deep drawers; and many other ways of combining drawers, doors and open shelving that weren’t previously available. In the past, the cabinet boxes were only offered in birch or white melamine. Now, they’re also offered in a dark wood tone option so you could create a two-tone effect by using contrasting doors or just coordinate more closely with the darker door styles. One of the other big changes from the AKURUM system is that the base cabinets are now installed using a rail mounted on the wall. This may be new to some contractors, but ultimately, it means that leveling the base cabinets is now even easier. The interior fittings on SEKTION are also significantly nicer than those that were offered for AKURUM, which is critical considering the shifting focus to storage in drawers instead of on shelves behind doors. Drawers are much more efficient than pull-outs or plain cabinets, and the right fittings make them easier to organize properly so you can maximize every inch. 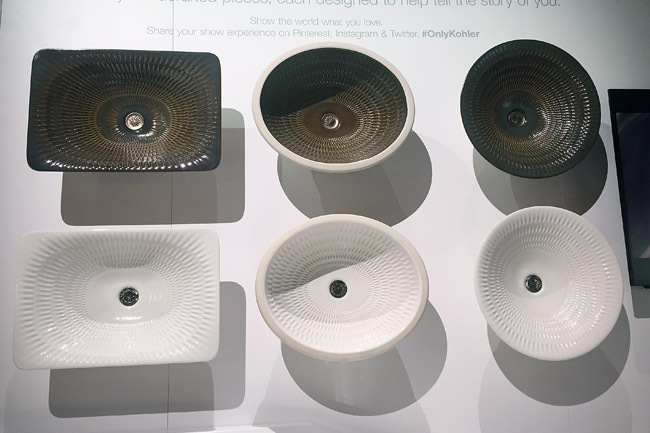 The new cabinets also offer integrated lighting options, which was a huge trend, particularly in the European cabinetry, exhibited at KBIS last month. It looks like they’re still working out some kinks on the website, since many of the photos are missing. I’m looking forward to taking a trip to Kansas City, possibly at the end of this month, to see the new cabinets in action. The Kitchn compares and contrasts AKURUM vs. SEKTION back in September. Global News Canada speaks to IKEA about the new system in January. Great photos in this article. All images via the IKEA Website.